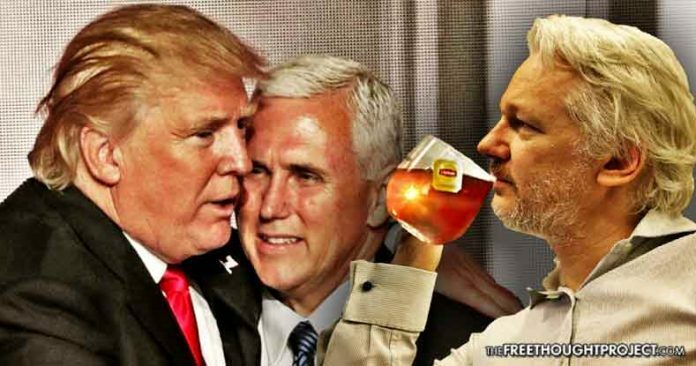 Washington, D.C. – In a tweet this morning, WikiLeaks founder, Julian Assange, made a prescient observation that the ongoing deep state coup against President Trump is an operation by establishment forces to unseat Trump and replace him with Vice President Mike Pence. Assange noted that Trump’s political capital has “been openly looted for months now by GOP, CIA, Netanyahu, Goldman Sachs, etc. Pence, known as a deeply religious man, was said to be “beside himself” over Trump’s comments on the tape. Pence’s wife Karen was reportedly disgusted and called Trump “reprehensible—just totally vile,” according to the Atlantic.